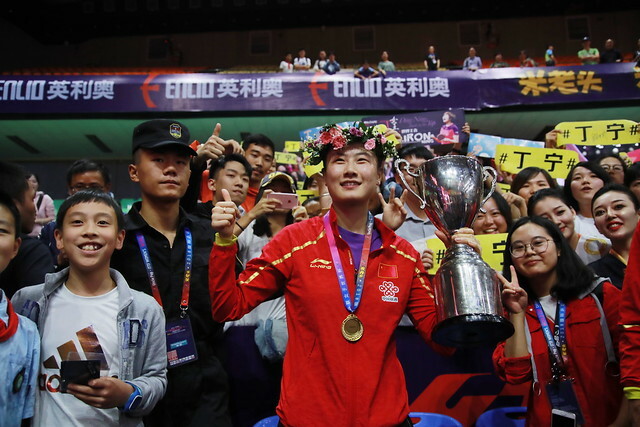 Third place one year ago in Markham; at the Uncle Pop 2018 ITTF Women's World Cup in the Chinese city of Chendgu, on Sunday 30th September it was the same step of the podium for Chinese Taipei’s Cheng I-Ching. Just as one year ago when overcoming Miu Hirano, she beat a Japanese adversary in the crucial contest, the no.4 seed, she accounted for Kasumi Ishikawa, the no.2 seed, in five games (11-8, 11-7, 12-10, 11-13, 11-8). Kasumi Ishikawa, just as earlier in the day when facing Ding Ning, made a fast start; she had won the first three points of the match, she established a 4-1 lead but the forehand potent, it was the Chinese Taipei player who secured the opening game. Boosted by the success, Cheng I-Ching made the better start in the second game; she went ahead 5-1, Kasumi Ishikawa reduced the deficit to one point at 6-5 but never gained parity. Two games to nil ahead, Cheng I-Ching extended her advantage; in the third game Kasumi Ishikawa established a 9-7 lead, for a player of her level, she made two relatively unforced errors trying to execute forehand top spin strokes. Cheng I-Ching won three points in a row; at 10-9 she held game point, the point was saved but when a second opportunity arose at 11-10 she converted. Simply Cheng I-Ching had taken her chances; Kasumi Ishikawa had missed golden opportunities. Chances missed chances taken, in the fourth game it proved a very similar scenario; only this time the player who let the opportunity go begging was Cheng I-Ching, twice she held match point before Kasumi Ishikawa prevailed. Motivated by the narrow success; in the fifth game Kasumi Ishikawa went ahead 5-1 but the next four points went to Cheng I-Ching; at 10-8 Cheng I-Ching held two match points, in a match of chances, she seized the opportunity. Success for Cheng I-Ching and a reversal of fortunes; earlier this year she had lost the Kasumi Ishikawa in the third place match in Yokohama at the Asian Cup.